Do you remember the first time you walked into a Unitarian Universalist church, and it felt like home? Some of you were born into the church - so you probably don’t remember. I’ll always remember my first encounter with this faith. It was 1994, and my son Adrian was a tiny baby, just a couple of months old. Friends had encouraged me to attend the Fellowship in Fayetteville, Arkansas. I remember being nervous. I had no idea what to expect. As I arrived, a kind person showed me to a seat. I looked around at a room full of faces - all new to me. A man holding a guitar went up to the front of the sanctuary and sang “With A Little Help From My Friends” as the worship began. Hmm ... this will be interesting, I thought. And it was. I settled into my chair and experienced the rest of worship. I don’t remember much of what was said that day - except, during joys and sorrows, a number of people stood up and talked about their satisfaction in the outcome of a recent city election. Several of the new city council members belonged to that church. And they talked about their plans to create a more livable, more sustainable city. There are many facets to Unitarian Universalism. The one that grabbed my mind and soul 19 years ago was our commitment to justice. Putting our belief in the inherent worth and dignity of every person into action. William Ellery Channing - the minister who proudly claimed a certain liberal religious people to be Unitarian Christians (not Trinitarian Christians) in 1819 - Channing said, “Let your life speak more loudly than your lips.” That sentiment forms a core belief in our church. Today, as we sit here in our beautiful sanctuary, singing songs, holding each others’ joys and sorrows, turning that phrase “Unitarian Christianity” over in our minds ... there is a woman named Ana walking across the Sonoran desert. She isn’t looking for her tribe. Her people are back home. In the lush, forested mountains of Guatemala. She loved it there. But it was hard to earn enough money. She wanted her two children to go to a good school. But that meant paying for tuition and paying for books. So she made the hardest decision of her life. Ana worked a little extra and saved up money. She sent her children to her sister’s house. She tucked photographs of them in her backpack. And she headed north. First by bus. After she crossed the Guatemala/Mexico border (not an easy crossing), Ana hitched a ride on top of a train. When the train stopped in small towns, she and other train top riders hurried down and quickly knocked on the doors of nearby houses, asking for food. Sometimes she got lucky and was handed beans wrapped in a tortilla. Most times, she came away empty handed, rushing to make it back to the train before it started rolling down the tracks again. After days of hard traveling, she arrived in Nogales, Sonora, Mexico. She’d heard stories, and she knew the hardest part of her journey wasn’t getting across the border, but what awaited her on the other side. A harsh desert. Searing daytime temperatures, at least 90 degrees. Down in the 50s at night. Anything she carried with her would start to weigh her down in the heat of the mid-day sun. Other border crossers advised her to pare down to as little as possible. Ana left behind the pair of nice shoes, the hairbrush, make-up, and blouse that she was saving for when she arrived in Phoenix. She kept the photographs of her two children. Ana’s walk in the desert is difficult. The terrain is not anything like her homeland, Guatemala. The desert floor is uneven. Cactus spines reach out for her. Stems from the jumping cholla cactus actually seem to hop on her as she walks by. Shade is hard to come by. She worries about Border Patrol, and travels mainly at night. Ana was told the walk from the border to Phoenix would be about a day. But it’s 180 miles from Nogales, Mexico to Phoenix, and that’s walking a direct path. Ana can’t do that - she is out in the wilderness, on migrant trails. It will take her days to reach Phoenix. If she can find enough water to sustain her. If she doesn’t get blisters the size of a half-dollar coin, spread across the bottom of her feet. If the sun doesn’t overwhelm her. If she isn’t caught by Border Patrol. We are going to leave Ana there. All alone in the Sonoran desert at 11:45 am on Sunday morning. We don’t know how her story ends. She may make it to Phoenix, and find work that will pay her enough that she can send money home for her children’s tuition. She may be taken by Border Patrol. Held in a detention center for days, with nothing more to eat each day than one package of peanut butter crackers. Or she may join the souls of around 200 other people, who will die this year in the Sonoran desert, trying to make a better life for themselves and their families. Crying out in her one voice, in grief for all she lost. 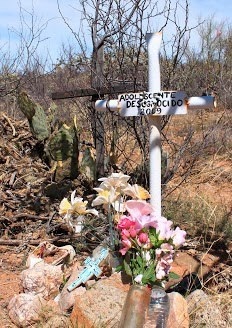 If she dies, and her remains are found by humanitarian aid workers, a cross will be erected at the site, with the word desconocido: “unknown,” written on it. I’ve been out on those migrant trails, walking with a group called the Samaritans, who provide help to migrants in distress. They bandage feet. They offer food, water, and medicine. They are prohibited by law to provide transportation, even if it is to a local hospital to treat severe health issues. I’ve only been on short walks with them. But each time, our path takes us to one of those little white crosses. They are often tucked next to a shrub. Surrounded by carefully placed objects: a plastic water bottle, a found shoe, a glass candle, stones arranged around the cross. Almost as if by choosing a stone, and gently laying it on the hard scrabble earth of the desert, a last bit of dignity and honor is offered to that person. In that one moment, shining a light on an unknown life in an attempt to make it visible again. You know what is perhaps the most beautiful thing about this church? Although all those are certainly beautiful and provide me with much joy and peace and inspiration. The most beautiful thing here is that each and every one of you matter. It matters when you are here. When you show up, you are known. We try our best to really see each other. We are in a special relationship at Throop. When you decide to make Throop your church home, you aren’t asked to recite a creed. You don’t sign on to a profession of faith. We don’t put you through a hazing ritual - although on New Member Ceremony Days, I do ask the new members to serve pieces of our celebratory cake during the potluck. We ask you to covenant with us. To promise to be in an on-going relationship that includes attention to your own spiritual growth. Your commitment to be an active participant in this community. To continue your authentic search for truth and meaning. In Unitarian Universalism, this promise to be in community extends beyond the four walls of this church, to our sibling churches like First Church LA and Neighborhood Church. And sometimes being in covenanted relationship is hard. We’re all human and sometimes we get grumpy. We have aches and pains and financial problems and bad days. A few weeks ago, one of our members admitted that she was right on the verge of biting someone! Luckily she didn’t! We aren’t committed to a creed. Words don’t bind us. Our relationships do. And since we love beyond belief, that means in this room today, we worship all together as Unitarian Universalists. And our personal spiritual paths take us in many directions and forms: Christianity and Atheist and Buddhist and Mystic and Agnostic. When I tell people this, they wonder how we do it - some days it’s by the skin of our teeth! But we learn how to make space for ourselves. And for other people’s beliefs. And in the midst of this cacophony of religious pluralism, our covenant guides us to go even further. It asks us to raise our voices and sing not with just the people we know, but for the people in the world who need us. People like Ana. We covenant to affirm the inherent worth and dignity of every person and to promote justice, equity and compassion in human relations. That’s a bit wordy, and sometimes I like to boil it down to these simple words attributed to Jesus: Love your neighbor as yourself (Matthew 22:39). We are capable of taking that love to great heights, because we bring it out of the sanctuary and into the streets. It was that visceral expression of Love in Action that first drew me to Unitarian Universalism, and it is one of the arms that kept pulling me back in when my heart was broken. No matter where you stand on the issue of immigration reform, there are ways we can stand on the side of love and help bring a sense of dignity into people’s lives who are caught in a web of tough economic realities. Our denomination has focused on immigration reform for the past three years. On June 8, our congregation will engage in a Visioning process, to help guide our directions and actions over the next few years. What would it look like for our church to stand on the side of love with people who are here without US documents? Caravan up to Sacramento on May 19 and join other UUs from across the state for an Immigration Reform Day at the Capitol. Create a relationship with the Pasadena Community Job Center on Lake Avenue. There is ample opportunity for us to be of service and create connections with undocumented workers in our own community. My people. Our voices cry out for love and justice. and your power to heal.